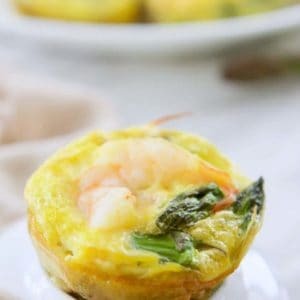 I love the convenience of egg cups or mini frittatas, make some ahead and freeze for a quick meal. 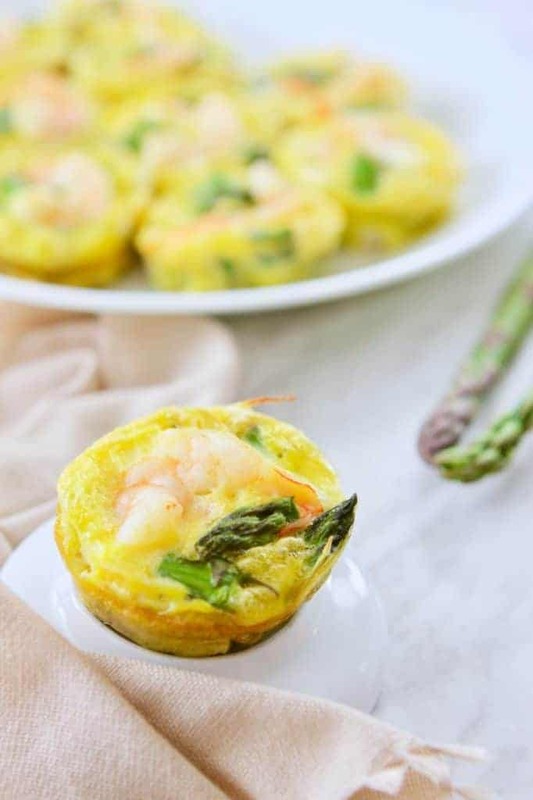 These Asparagus Shrimp Egg Cups are simply easy to make, healthy and delicious too! I am always on the look out for simple and healthy meal ideas. With a busy household and 2 young boys, our real food meals need to be easy to make too. 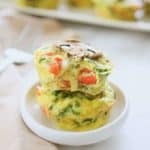 Egg cups or muffins are great for a savoury breakfast, a quick lunch or dinner meal option. Asparagus spears are best when fresh. They are an excellent source of vitamin K, folate and anti-inflammatory nutrients.1 Just break off the woody end before washing and cut into 1 cm pieces. Shrimp. I used frozen shrimp that was thawed and peeled for this recipe. Slice or cut shrimp half lengthwise or cut into smaller pieces if you prefer. Eggs. Pastured eggs are the best option, try to get these if you can. I can tell the difference with the colour of the egg yolks vs. organic eggs (which may not be from pastured hens). Pre-heat the oven to 350ºF. 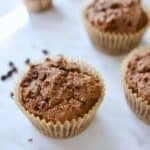 Grease a muffin tin with coconut oil. 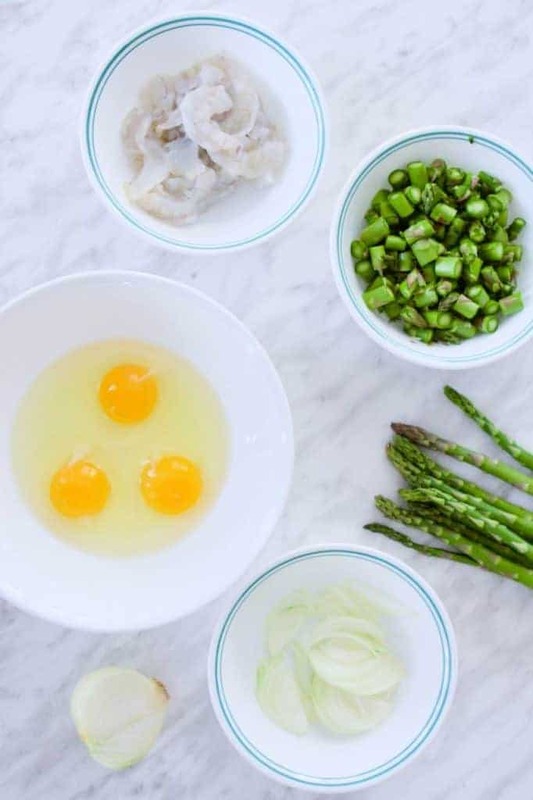 In a mixing bowl, add onion, asparagus and shrimp. Mix well. Scoop into the muffin tin, distributing evenly. Using the same bowl, whisk the eggs and salt. Distribute evenly into the muffin tin. 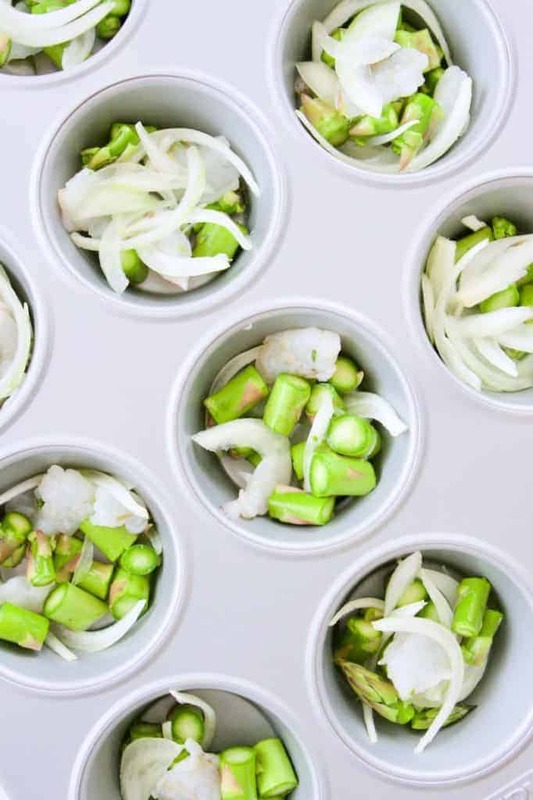 Place the muffin tin into the oven and bake for 20-25 minutes until set. Cool slightly, then remove from pan. Serve warm. Or refrigerate or even freeze for future use. Let me know if you try this recipe, please leave a comment or rating below. What else do you like in your egg cups or muffins? 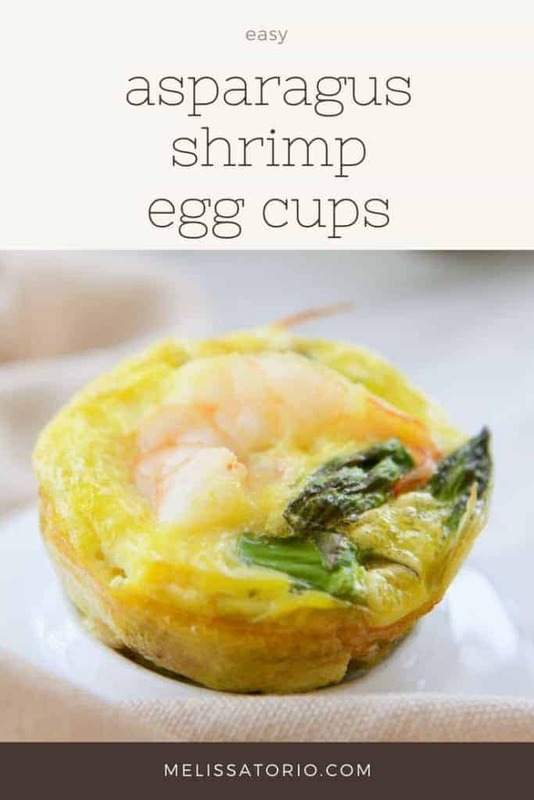 Make these easy and healthy egg cups for breakfast, lunch or dinner. Pre-heat oven to 350ºF/180ºC. 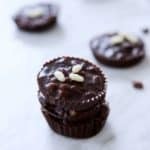 Grease muffin tin with coconut oil. Break off woody ends from asparagus spears. Cut into 1 cm pieces. Slice or cut shrimp in half lengthwise. Cut into smaller pieces if preferred. In a mixing bowl, add onion, asparagus and shrimp. Mix well. Scoop into muffin tin, distributing mixture evenly. In the same bowl, crack eggs open and add salt. Whisk well. 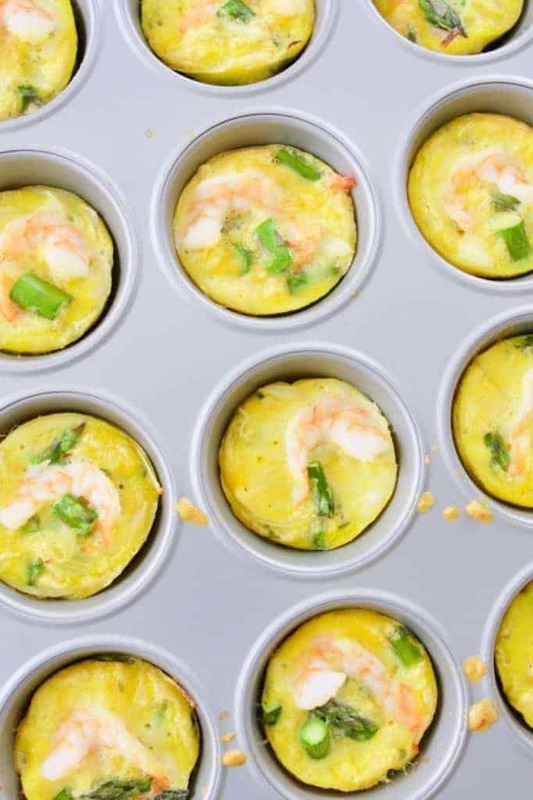 Distribute beaten egg mixture evenly into the muffin tin. Place muffin tin into oven and bake for 20-25 minutes until set. 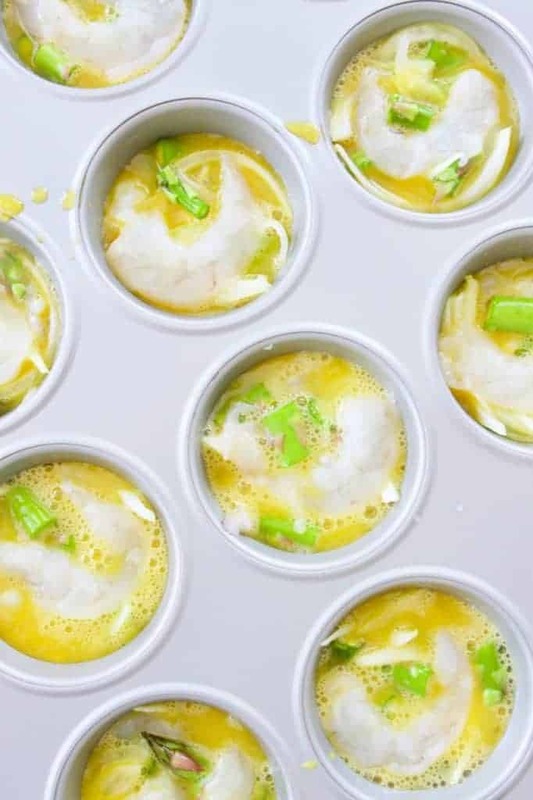 Let cool slightly, then remove egg cups from muffin tin. Serve warm and enjoy. You may refrigerate or freeze egg cups for future use. “Asparagus.” The World’s Healthiest Foods, whfoods.org/genpage.php?tname=foodspice&dbid=12.